Bob Cozzi has been an RPG programmer since 1978. He is the author of several books on RPG programming, including, "The Modern RPG language." He is webmaster for his popular www.rpgiv.com website and produces several RPG training events each year, including the annual RPG World Conference (www.rpgworld.com). His production company, Crooked Jaw Productions, produces the "i5TV" and "Shoot'n iT" podcasts (available on the i5Podcast.com website). Over the years, Bob has consistently helped System i5 and RPG IV programmers to be more productive by creating and publishing tools, tips, and techniques for their programming arsenal. Bob's original publication, Q38 Technical Journal, had the tag line "Providing the Solutions" -- and with 101 Dynamite Tips 'n Techniques, he continues to excel in that mission. 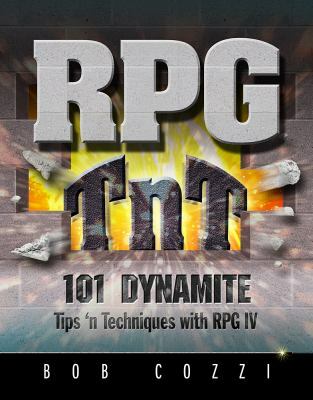 For more, visit Bob's websites: www.RPGWorld.com, www.rpgiv.com, www.i5Podcast.com, and www.rpgxtools.com.Cozzi, Bob is the author of '101 Dynamite Tips 'n' Techniques With Rpg IV ', published 2007 under ISBN 9781583041215 and ISBN 1583041214. Loading marketplace prices 3 copies from $22.95 How does the rental process work?